In those first days, readership consisted of me, a few relatives, a couple of neighbors, and some friends of relatives. Then a handful of other followers signed on, for reasons I am still trying to figure out (thanks Tenshi51 and Stylemaster, whoever you are; and Fian from AdaptaGal). Since then, we have had over 26,000 visits, 37,000 page views, with an average visit length approaching 2 minutes (which means people are reading, not just clicking through). Of course, these statistics are minuscule compared to many, but not a bad start. John from Tennessee, for taking it on yourself to spread the word, without being asked or asking for anything in return. American Thinker, which helped me tremendously by publishing several of my articles. The websites which have linked to my posts and/or put me on their blogrolls, including (but not limited to), Instapundit, MichelleMalkin, Newsbusters, HotAir, Gateway Pundit, Urgent Agenda, AtlasShrugs2000, The Other McCain, Conservative Grapevine, Right Soup, BarcePundit, Likelihood of Success, Moral Compass, Let's Get It Right, The Bipartisan Rules, Mainstream Conservative, Front Porch Anarchist, Blogs for Victory, Watcher of Weasels, The Union Label, Hawaii Reporter, Legal Blog Watch, Average Joe American, and many, many more. The People and State of Illinois, for delivering the Blago scandal just when I was running out of topics, and the blogs which have cross-posted, re-posted, quoted from and linked to my Blago analysis, including but not limited to, Illinois Review, Backyard Conservative, Illinoize, Marathon Pundit, Bill Baar's West Side, Open Line Blog, McHenry County Blog, Capitol Fax, The Real Barack Obama, Peoria Pundit, and many of the others listed on The Official Guide to Blagojevich Blogs. The anonymous authors of the now defunct John and Sarah 2008 Blog, for inspiring me to stand up to the now-common tactic of falsely accusing conservatives of racism: "Considering that it adds no value to the debate at all, one has to conclude that Jacobson is doing only what other McCain supporters are starting to do, produce these worthless pieces from some narrow perch in order to cover up their own racist bigotry" (post is still available in Google cache). Cornell Law School, a great place, for featuring this conservative blog on its website and in its publications. My wife and children for dealing with my Blogger Mood Disorder (a condition in which one's mood swings up and down in sync with the level of blog traffic). And many other thanks, like health, safety (thanks troops), and the ability to live in the greatest country on earth. Happy New Year to all (even Obama). Barack Obama loves to invoke the "rule of law" when it suits his political purposes, but not in the case of Rod Blagojevich's appointment of Roland Burris to Obama's empty Senate seat. In the Burris case, politics apparently trumps the law. There is no substantial legal dispute here. Harry Reid and other U.S. Senators have no right to refuse to seat an appointee merely because they do not like the appointer. I think the situation might be different if there were evidence that Burris bribed Blagojevich (in which case the Democrats could challenge whether there was a true appointment), but that is not the case here. Blagojevich's appointment of Burris simply is politically inopportune for Democrats, and that is not enough to avoid what appears to be a constitutionally valid appointment. Barack Obama supports Reid's refusal to seat Burris. What does this say about Obama's commitment to the "rule of law." We heard about the "rule of law" ad nauseam during the campaign, as a means of attacking Bush policies on Gitmo, interrogation, and a myriad of other issues. When the U.S. Supreme Court ruled that some constitutional protections applied to non-uniformed enemy combatants captured on the battlefield, Obama proclaimed that “this is an important step toward re-establishing our credibility as a nation committed to the rule of law." It appears that the "rule of law" applies to Gitmo detainees, but not to Roland Burris because in the Gitmo case the politics helped Obama, while in the Burris case the politics hurt Obama. Much like campaign finance reform, Obama threw the "rule of law" overboard for political gain in the Burris case. Illinois Gov. 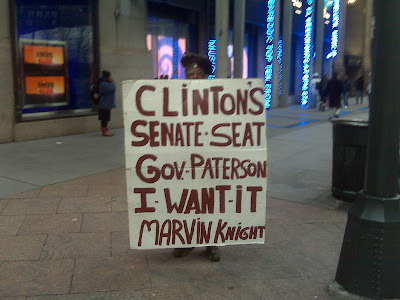 Rod Blagojevich's appointment of Roland Burris has put the Democratic party in a box. By appointing an African-American to the empty Senate seat, Blagojevich has forced his political opponents to risk being called racists. In supporting the appointment, Congressman Bobby Rush called opposition to Burris an attempted lynching. Whether this analogy is justified is questionable, but it is the same tactic that has been used against conservatives for decades, most recently by the Obama campaign. Democrats are getting a dose of their own medicine, and I hope it goes down like a bitter pill. U.S. Attorney Patrick Fitzgerald has reversed course, and now wants to release to the Illinois House impeachment committee some wiretap evidence relating to the federal criminal case against Gov. Rod Blagojevich. Previously, Fitzgerald went so far as to ask the House committee not even to delve into areas covered by the criminal case, so as not to provide Blagojevich the chance to take testimony now from witnesses who may not testify in the criminal case for months. The scope of what Fitzgerald now wants to release is narrow, and does not relate to the high profile claim that Blagojevich tried to sell Obama's open Senate seat. Nonetheless, the only conclusion to be drawn from Fitzgerald's about-face is that Fitzgerald is concerned Blagojevich will not be removed from office without some criminal conduct put in issue in the impeachment hearings and trial. The impeachment hearings so far ring very hollow. Devoid of allegations of criminal conduct, the Illinois legislature looks like it is searching for a pretext to remove Blagojevich. The grounds raised so far are almost laughable. Blagojevich supposedly did an end-run around a legislative rule-making committee (JCAR), which seems like normal push-and-pull between the executive and legislature. Blagojevich also supposedly imported flu vaccine improperly, and didn't follow administrative rules as to freedom of information act requests. All of this is a big so what, and not the stuff of impeachment. Ed Genson's impassioned defense that Blagojevich is left to fight shadows rings true, so far. The legislature needs to put some meat on this impeachment bone, or Blagojevich may end up looking like the victim of a politically motivated vendetta. That may not seem like enough to survive impeachment now, but after a few more weeks of this the public may tire and legislators may start making different political calculations by the time of the impeachment trial. That is where Fitzgerald's moves come in. Fitzgerald wants Blagojevich out of office for a variety of reasons, including to put pressure on Blagojevich to take a plea. Fitzgerald sees what is obvious: Impeachment is in trouble without the evidence Fitzgerald says he has. So Fitzgerald, who seems to be pulling the impeachment strings, has decided he has to give the House committee some rope with which to hang Blagojevich. Whether it happens, and is enough, remains to be seen. The mainstream media loves Ted Kennedy despite the fact that Ted left a woman to die in a ditch and then lied about it. But Caroline Kennedy, for some reason, doesn't pass the test, even though she didn't lie, and people didn't die. Caroline's liberal creds are impeccable, she's a Kennedy, she's wealthy enough not to have to worry about paying higher taxes, and she went to Harvard and Columbia. What's not to like? Nonetheless, the mainstream media is turning on Ted's niece with a vengeance. The New York Times derisively describes Caroline as "forceful but vague, largely undefined and seemingly determined to remain that way." Wait a second. That description fits Barack Obama. And The Times loves Obama. Me thinks there is something of a sexist bias in the mainstream media. Just ask Hillary. The legislative process to draft articles of impeachment is under the complete control of the House Democratic majority, which among other things, has denied both Blagojevich and House Republicans the right to issue subpoenas. The legislative process is purely political, and the politics of the Democratic majority and Fitzgerald are perfectly aligned for now. Once the articles of impeachment are passed, however, the political process and Fitzgerald lose some measure of control. Article IV, Section 14 of the Illinois Constitution provides that once the House has impeached the Governor, "[i]mpeachments shall be tried by the Senate. When sitting for that purpose, Senators shall be upon oath, or affirmation, to do justice according to law. If the Governor is tried, the Chief Justice of the Supreme Court shall preside. No person shall be convicted without the concurrence of two-thirds of the Senators elected." At trial, we can expect Blagojevich to renew his request to call any and all witnesses necessary for his defense, and to invoke standards of relevance similar to what prevails in court. Unless the articles of impeachment are so narrowly drawn as to exclude any use of any information in the Criminal Complaint (or anticipated Indictment), it is likely that the testimony of Emanuel and Jarrett will be relevant to the issue, among others, of Blagojevich's alleged attempt to sell Obama's open U.S. Senate seat. The decisions will be made by the presiding Chief Justice, not House Speaker Michael Madigan or Fitzgerald. While Fitzgerald may request a ruling from the Chief Justice denying Blagojevich the right to call witnesses whose testimony may "interfere" with the criminal case, there is no guaranty that such a request will be granted. If the Chief Justice grants Fitzgerald's request, the result may be a delay in the impeachment trial until after the criminal trial so that Blagojevich receives a fair impeachment trial to which Blagojevich appears to have a right under the Illinois Constitution. By contrast, Blagojevich has no right to a fair impeachment hearing. At this point, it is far from clear that the legislature will be able to get through an impeachment trial by February 12, 2009, as the Lt. Governor Pat Quinn boldly predicts, or that Obama aides won't be witnesses. My guess is that if there is to be a full Senate trial it will not be completed by February 12, 2009, or any time prior to the criminal trial. If there is a conviction, there will be no need for an impeachment trial. If there is a not guilty verdict, at the impeachment trial Emanuel and Jarrett will be witnesses for the defense. What a difference a decade makes. In the fall of 1998, President Bill Clinton faced impeachment for obstruction of justice and perjury in giving false and misleading testimony under oath regarding his affair with Monica Lewinsky. Congressional impeachment proceedings, while focused on the issue of testimony under oath, were against the backdrop of wide-ranging controversies regarding the Clintons' (that's Bill and Hillary) use of the Lincoln bedroom, the While House travel office, and other perquisites of executive power to reward campaign contributors. This page advocates a negotiated settlement that would allow Mr. Clinton to remain in office in exchange for a censure based on his admission of lying under oath....The public is ready for a deal built around a cluster of principles that include electoral continuity, condemnation of Mr. Clinton's personal behavior and recognition of his responsibility for breaking the law and misleading the American people. Fast forward to 2008. Illinois Governor Rod Blagojevich has not been convicted of, or admitted to, any crimes. The impeachment proceeding, at the request of U.S. Attorney Patrick Fitzgerald, will not touch upon any of the alleged criminal conduct which is the subject of federal investigation. If Mr. Blagojevich were less narcissistic, he would leave public service forthwith so constituents might get beyond the embarrassment of his administration....The impeachment inquiry by the Legislature has been denied full details of the criminal charges. But constitutional issues of government frozen by scandal are at stake. The hearings so far have managed to summarize the one extraordinary achievement of the Blagojevich administration — the accumulation of $58 million in political contributions across the last eight years. Media accounts have detailed a pervasive pay-for-play culture....There’s no reason the governor’s bombastic court posturing should hogtie Illinois. If impeachment is the only antidote, the Legislature should have the courage to show taxpayers some mercy. On Christmas Day, British television Channel 4 provided Iranian President Mahmoud Ahmadinejad a platform to broadcast "an alternative Christmas message on British television to rival Queen Elizabeth II's annual address." In the message, Ahmadinejad said that "if Christ were on Earth today, undoubtedly he would hoist the banner of justice and love for humanity to oppose warmongers, occupiers, terrorists and bullies the world over." The speech received widespread media attention. The night before the speech, on Christmas Eve, Iran hanged 10 people. This event received almost no mainstream media attention. Public hangings, often from cranes, is a tool used by the Iranian regime to suppress political opposition, with political dissidents often charged with "crimes" to provide a pretext for execution. Homosexuals (regardless of whether loyal to the regime) also are a target of hangings. These hangings pass silently in the night because they do not fit the mainstream media construct that the problem in Iranian-U.S. relations is the Bush administration's refusal to "talk" to Iran. The problem, however, is not a lack of talk, it is the nature of the Iranian regime. Perhaps next year British television will ask Ahmadinejad to stop the executions of dissidents, homosexuals, and others deemed undesirable, at least on Christmas Eve. Is The Wall Street Journal Now Covering For Obama In The Blagojevich Scandal? The Wall Street Journal has been an exception to the mainstream media rule of unquestioned support for Barack Obama, and to this day the WSJ's editorial page is one of the few places where Obama's proposed policies are questioned. But a news article in today's WSJ, "Reform Law Might Have Aided Blagojevich Scheme," gives me great concern. The article describes how Illinois Gov. Rod Blagojevich was able to take advantage of a 2003 ethics law which revamped the Illinois Health Facilities Planning Board. The ethics legislation was supported by Obama, who was described in the article as being "influential" in its passage. After the Planning Board revamp, Blagojevich was able to put together a "friendly, five member majority" which Blagojevich allegedly used to squeeze campaign contributions from businesses which needed Planning Board approval, and which is a focus of the Criminal Complaint filed against Blagojevich by U.S. Attorney Patrick Fitzgerald. So what does Obama have to do with this? The WSJ article points out that after passage of the law, Obama received $15,500 in campaign contributions from three board members "who since have been identified by prosecutors as participants in the alleged abuses." And who coordinated all the Planning Board scheming for Blagojevich? None other than Antoin Rezko, the longtime Obama campaign supporter and fundraiser whose wife helped the Obamas purchase their house by simultaneously purchasing the adjoining lot. So Obama helps pass a law, which enables Blagojevich to control the Planning Board whose members then donate to Obama's campaign, under the coordination of Obama fundraiser Tony Rezko. Does this mean Obama did anything wrong. Not necessarily, but it certainly raises questions, though not apparently to the WSJ. Why does the WSJ feel the need to describe Obama as an "unwitting ally" of Blagojevich's schemes. We don't know that to be true, or not true. Why not just report the news (including that Obama has not been charged with any wrongdoing), and let the readers draw their own conclusions? The tone of this article is similar to what we have come to expect from The New York Times and other pro-Obama newspapers, which use news articles to express editorial opinions, and which accept at face value that Obama has no clue what is going on around him. Lets hope this WSJ article is not the taste of things to come, from one of the last truly inquisitive mainstream newspapers. Welcome to Legal Insurrection's Official Guide to Blagojevich Blogs. What makes this "official"? The same thing that makes people think the Franklin Mint is related to the U.S. Mint, even though the commercial says it's not. These blogs have frequent posts or links specifically about Blago. This list is a work in progress and will be updated frequently. Please post suggested blogs as Comments, or e-mail me at contact/at/legalinsurrection/dot/com (if you can't figure out what to change in the address, I'm not sure I want your input). The blogs are listed alphabetically within category. Please, don't anybody create the "AAABlagoBlog" or you won't be listed. Blago Blog Central - "This blog is about Illinois, its miscomings and its criminal element." Moved to first place after it was pointed out that there is no "the" in the name. Wins the award for best blog title banner. Blagojevich Blog - From Windy Citizen. "Tracking the latest on Illinois Governor Rod Blagojevich's Federal Indictment" or so they say. Most direct name, going to be hard to beat alphabetically. BlagoWatch - Why didn't I notice this sooner? Collects stories from the internet that reference Blago, and people comment. Can't tell who runs it. Looks like one of those social networking things that people over 40 can't understand. Worth a look. BloggingBlagoBlog - Describes itself as "More Nonsense From the Governor and the Illinois Democrat Party." Describing your blog as "nonsense" does not set a very high bar, but at least you won't be disappointed. Created by Illinois Republican Party. Lots of videos. Bloggin Blagogojevich's Blunders - Not updated since January 2006, which shows how far back Blago's "alleged" misconduct goes. But of course, Obama knew nothing. At this point, of historical value only, but a great name. Patty Blagojevich's Freakin Blog - Not really, but talks like her. Throws the F-bomb every other word. R-rated. Beltway Blips - Aggregates both news and blog posts and lets readers vote. Clout City - Collects Blago blog posts from "Chicago Reader." Backyard Conservative - "This blog is a product of over 25 years of biting my tongue in polite society." We must have been separated at birth, because that's why I started blogging. When she's not biting her tongue, she's sticking it out at Blago, Democrats, liberals, well you get the picture. Bill Baar's West Side - Looks like this guy knows where all the political bodies are buried in Chicago, and he's digging for Blago. Capitol Fax - Excellent blog by Rich Miller, who also writes for the Chicago-Sun Times, and seems to know Illinois politics. Highly recommended even though he does refer to me at "this guy." Chicago Argus - from "Chicagoland's far South Side." If that's not enough, also the "World's Greatest Weblog" -- High opinion of himself, and deserved. Good stuff on Blago. Critical Thoughts - Not critical of me, so must know what he (she?) is talking about. Illinoize - Pulls from several Illinois blogs, commentary and news. Run by someone who specializes in phonetics. Illinois Review - "Crossroads of the conservative community." Cross-posts many of my articles about Blago and Lisa Madigan. Other than that, they exercise good editorial judgment. McHenry County Blog - Focuses on McHenry County (duh!) but now on the trail of Blago, with great screen shots of headlines and videos. Open Line Blog - "From Aurora, the 2nd largest city in Illinois." Doesn't like Blago, at all. May have to change the slogan, since at the rate Obama is hiring, Washington, D.C. , may soon be the second largest city in Illinois. The Barbershop - Dennis Byrne, Proprietor. A real writer really writes on everything Illinois, including Blago. The Real Barack Obama - f/k/a Rezkowatch, soon to be known as the ObamaRezkoBlagoRahmboJJJrValerieWatch. I normally don't put "Obama" sites on this list, but Blago is emerging from the crowd here, and they have a Blagogate Reading List. The Sixth Ward - "Dispatches from Chicago's south side." Obsessed with Blago and potholes, not that there's anything wrong with that. Ace of Spades HQ - Not a ton of Blago posts, but when they do, ouch. Like a spear through the groin. American Thinker - Apparently has a lot of Illinois thinkers, so they know Illinois politics well. The intellectual of this bunch, by far. Fullosseous Flap's Dental Blog - What a catchy name. What does dentistry have to do with politics? Beats the floss out of me, but this blog has some good Blago posts. Hot Air - Good posts on Blago, but mixed in with posts on unimportant things, like the fate of the nation. Marathon Pundit - Based in Illinois, but so much more, so I didn't want to pigeon-hole it into the "Illinois" category. Describes itself as "your Blagojevich scandals headquarters." Hey, that's my gig. Michelle Malkin - Run by Michelle Malkin. 'Nuff said. Good stuff on Blago, when you can get it. Who else could think up a posts like "corruptocrat alert" and "The Real Housewives of Crook County"? NewsBusters - Busting the mainstream media's coverage of Blago. Rightwing Nuthouse - Rick Moran is from Illinois, but covers just about everything. His articles on Illinois politics and Blago appear frequently in American Thinker. Scared Monkeys - Not that scared. Very biting posts, but need to search for them under the "Barack-Obama" tag. Gateway Pundit - "Where hope finally made a comeback." Wins the award for "quickest on the draw." When Blago news breaks, I immediately check the web, and they already have a post with numerous links. Instapundit - Run by a law professor, but not a "law professor blog." Where else can you get Blago links next to links for the latest high tech gadgets? John Kass - Not really a blogger, more a columnist, but the "go to" guy on corruption in Illinois. I think Fitzgerald taps his phone just to find out what is going on. Lynn Sweet - Possibly my favorite Blago blog, by Chicago Sun-Times columnist named (drumroll, please) .... Lynn Sweet. The Blagojevich Blog - From the Springfield, Illinois State Journal-Register, but not updated that frequently. What a waste of a great blog name. Washington Wire Blagojevich page - Good reverse chronological (not the same thing as bass ackwards) list of Blago news posts from the Wall Street Journal. Althouse - Legal analysis, mixed with other more fun stuff. Hard to beat alphabetically. Legal Insurrection - "The best, most in-depth legal analysis of the Rod Blagojevich case, soup-to-nuts," if I do say so myself. Blagobusted.com - The Chicago Sun-Times' Blagojevich Section, including an interactive "Obama Family Tree" (I don't see Blago on it, but I'll keep looking). Funny Stuff. Isn't that what Blago is accused of? The Nose On Your Face - Original Blago video spoofs (and Obama too!). Illinois Poet Laureate - Poetry in the service of Blago, sort of. Lisa Madigan's own official website, featuring "MethNet"
I recently placed "tags" on my prior posts, to make it easier for readers to find posts by topic. Among the tags were "NY Times" and "media bias." As I began tagging the stories, however, I realized that every story I tagged "NY Times" also was being tagged "media bias." The history of NY Times biases are so well documented, I won't harp on them here. This once great paper, which I read daily until a few years ago when I couldn't take it anymore, is not just biased, it is manipulative. From its carefully timed hit pieces, to its foaming at the mouth columnists, to its attempts to damage national security, the NY Times deserves what it is getting. It is no wonder that the NY Times reports a 20% drop in ad revenue, and its stock price is down to six bucks. It would be easy to feel sorry about the demise of the NY Times. This country really, really needs good investigative journalists, a newspaper of national scope which can stand up to whatever administration happens to be in power, and an independent voice. The NY Times no longer represents these attributes. The NY Times reminds me of the person who killed his parents, and then pleads for sympathy because he is an orphan. So Merry Christmas, Happy Hanukkah, and best wishes to all, except the NY Times. One of the highlights of U.S. Attorney Patrick Fitzgerald's criminal complaint against Illinois Governor Rod Blagojevich, played out dramatically at Fitzgerald's news conference, was that Blagojevich used extreme profanity to describe Barack Obama's refusal to make a deal over the selection of a replacement for Obama's open Senate seat. Blagojevich allegedly is caught on tape complaining in colorful language how Obama only would give him "appreciation." The report released today by Obama's transition staff repeatedly denies any conversations regarding a "personal benefit" to Blagojevich in connection with the Senate seat. If there were no conversations and the subject of giving Blagojevich personal benefits never came up, why was Blagojevich so mad? Or is the Obama report's focus on "personal" benefits a smokescreen? Was there some benefit Blagojevich demanded that wasn't "personal" which was discussed? Or were the communications with someone not on the "transition staff"? Does this all depend on the meaning of "personal benefit" and "transition staff"? Looks like with the new Obama administration, we are going to need to dust off our dictionaries, which haven't been used since, oh, about 1998. On Friday, December 12, 2008, Illinois Attorney General Lisa Madigan filed a motion in the Illinois Supreme Court seeking emergency injunctive relief removing Gov. Rod Blagojevich from office, or alternatively, stripping Blagojevich of his executive powers. On December 17, 2008, just three business days later, the Court denied the motion without explanation, and also denied AG Madison's request for permission to file a complaint seeking permanent relief. That the Court denied the motion without even requiring Blagojevich to file an opposition reflected the complete lack of merit in AG Madigan's legal position, as well as the weakness of papers. Looking back at the sequence of events and papers filed by the State, it seems clear that AG Madigan could not possibly have expected victory on the merits. As detailed below, the alleged emergencies cited by the State were not true emergencies, and in the case of bond funding, were based on an incomplete presentation to the Court. Legally, the State's papers were cursory and not befitting the weighty nature of the legal issues. 1. Should AG Madigan have recused herself? AG Madigan was reported to be a potential challenger to Blagojevich in the next gubernatorial election. Blagojevich also reportedly was considering appointing Madigan to Barack Obama's vacant Senate seat in order to remove Madigan as a challenger. As a potential challenger and appointee, AG Madigan hardly was disinterested in the outcome of the lawsuit. The first mistake AG Madigan made was not to step away from the situation, and appoint someone else to make decisions as to the legal challenge to Blagojevich. AG Madigan had come under criticism immediately after the news conference held by U.S. Attorney Patrick Fitzgerald announcing federal criminal charges, with some claiming AG Madigan should have acted sooner herself. In this circumstance, with her political future on the line, AG Madigan must have felt pressure to act. I assume that AG Madigan believed she was acting in the best interests of Illinois by rushing to court just three days after the Fitzgerald news conference. Nonetheless, the conflict of interest (both real and perceived) should have been obvious to her and to those around her prior to the filing. Not surprisingly, at the press conference after the filing, numerous questions were asked of AG Madigan about her conflict of interest. The nature of AG Madigan's conflict of interest may not have been an absolute bar to her actions; I have been unable to find any specific rule which would have required her to recuse herself under these circumstances. Sometimes, however, it is necessary to go beyond what the law requires in the exercise of good judgment. Here, good judgment would have been to allow people who did not have a political interest in the outcome to tailor the legal strategy, so that personal political motivations were not ascribed to the State's legal actions. ►Loss of Faith In Government. In the court filings, AG Madigan laid out the negative impact on the public faith in government of Blagojevich remaining in office. Assuming this to be true, such a circumstance was not new and not an emergency. There had been public complaints regarding Blagojevich's alleged corruption for months if not years, to the extent that in June 2008, Speaker of the House Michael Madigan circulated "a memo outlining how legislative candidates can call for impeachment hearings against the governor, calling corruption during his tenure 'a tumor.'" MR. GREGORY: Let me press you on this. You talk about the charges that are in the criminal complaint, which, by the way, is not actually an indictment, it's not a formal charge against him. Are you aware of any of the evidence against him beyond what the public is aware of? MS. MADIGAN: Well, what I can tell you is that our office has been involved in providing assistance and information to federal law enforcement authorities all along. MR. GREGORY: So you're, you're aware of other evidence beyond what's in that complaint? MS. MADIGAN: All I can tell you is that our office has provided information assistance to federal law enforcement authorities. So clearly, Blagojevich's general alleged misconduct may have been a problem, but it was not an emergency or a surprise justifying Court action. As of December 12, 2008, when AG Madigan filed her papers and held her press conference, the likelihood that Blagojevich would appoint someone to Obama's seat based on cash or other payments, and that such a person would be seated, was small or non-existent. Again, AG Madigan raised an important issue, but not one justifying or necessitating emergency Court action. Further, Mr. Blagojevich's ability to borrow money in his official capacity is compromised. The State has postponed a $1.4 billion short-term debt offering because of the uncertainty over whether the State can provide the necessary accompanying certification that no threatened or pending controversy or litigation challenge Mr. Blagojevich's title to office. The State is also at risk of having its bond rating lowered due to concerns over the pending criminal charges. providers. I believe we have a backlog of at least a billion dollars in bills. In order to make those payments, there was short-term borrowing that was scheduled in the very near future. At this point, we -- they have postponed that. And it may be very difficult, if not impossible, to move forward on short-term borrowing, because as part of that process, as the attorney general, I play a number of roles. One is to essentially review and say that the short-term borrowing is legal, but another portion of that requires me to sign a certificate certifying that I am not aware of any proceeding or threatened litigation challenging the authority of the governor to hold his office. And so I at this point would not necessarily be able to sign that, and so I'm currently working with OMB to determine how we can proceed and handle that. A spokeswoman for State Treasurer Alexi Giannoulias said the attorney general's concerns held up the debt sale planned for Thursday. The competitive sale, which was postponed until Tuesday, had been generating good interest from potential bidders in the municipal bond market. While AG Madigan may have had legitimate concerns about her certification, no solutions to those concerns were reflected in the State's court papers, implying that funding may not be forthcoming any time in the near future. Additionally, the court papers did not mention that the financing had been delayed only until the following Tuesday. The papers implied, but did not state, that there had been an indefinite postponement. Certainly, a postponement of a few days to work out some wording changes sounds less dramatic than the impression created in the State's papers and press statements of an indefinite inability to issue bonds leading to governmental paralysis. At the time of the court filing, I questioned the wisdom of this stance by AG Madigan, predicting that she would end up having to go back on her representation to the Court as to the inability to complete bond funding. I was right. Just one business day after the court filing, and before the Court had ruled, agreement was reached to complete the bond issuance as a result of wording changes to the certification. Had AG Madigan not considered these wording changes prior to her filing? If wording changes to solve the problem were under consideration, why was the Court not informed that this wording problem would be resolved? There may have been legitimate concerns about the bond certification, but there was no real bond crisis. To the extent there was a crisis, it was precipitated by AG Madigan's own actions in questioning her own ability to issue a bond certification, and her delay in coming up with the necessary wording changes. Had the Court acted on Friday, December12, or over the weekend, the Court would have done so based on the false impression that the only way to solve the State funding crisis was to remove Blagojevich. 3. On what legal basis did the State expect victory? The legal theory behind the lawsuit was that Blagojevich was "unable to serve" because of a non-physical "disability." That "disability" according to the court papers was (a) the inability of Blagojevich to put the interests of the State ahead of his own political interests; (b) accusations of criminal and unethical behavior which have caused other politicians to call on him to resign; (c) operational issues regarding state government caused by the foregoing. This argument was extraordinarily weak. AG Madigan argued that the term "disability" was "unambiguous," yet spent several pages struggling to come up with a definition which helped her. The AG took this position because, as the AG acknowledged in her papers, the legislative history was not favorable to her interpretation of the term. Lacking support in the legislative history, AG Madigan argued that anything which impaired a Governor's ability to make decisions in the interest of the State, whether due to criminal or ethical lapses, constituted a "disabling" condition, and therefore a disability. AG Madigan used the dictionary definition of "disability" to reach the conclusion that being "unfit" for office constitutes a "disability" under the Constitution. The argument came without any authority whatsoever where any court had interpreted such a non-physical condition, indeed mere accusations of wrongdoing, to constitute a "disability" sufficient to remove a Governor. If AG Madigan was going to ask the Court to take unprecedented action, she at least should have given the Court some authority other than contorted references to the dictionary. So as enacted by the Illinois legislature, in order for there to be succession, there must not only be a disability, that disability must result in the Governor not being able to exercise the powers and duties of the office. This language contradicted, or at least severely weakened, the argument that merely being ethically "unfit" for office is the equivalent of a constitutional "disability." At a minimum, AG Madigan's court filings should have addressed this statute. AG Madigan's argument also sought to expand the Court's authority to strip a governor of powers so far as to remove any semblance of separation of powers, even though separation of powers is spelled out in Article II, Section I of the Constitution ("The legislative, executive and judicial branches are separate. No branch shall exercise powers properly belonging to another"). In effect, AG Madigan was asking the Court to violate a fundamental rule of statutory construction, which is that you don't read a statute or constitution such as to read some provisions out of existence. If being ethically or criminally suspect (not even convicted) were enough to render a governor "unfit" and therefore under a "disability," then the Courts would end up being the referee of political disputes and accusations, in violation of the separation of powers provision. AG Madigan also did not address the existence of the alternative legislative impeachment process, other than to say that such process existed but might take too long. The Court's ability to substitute its judgment for legislative impeachment process was the huge legal issue in this case, along with the issue of "disability." The failure to address this issue head on is hard to understand. If a criminal or ethical taint were sufficient to constitute a "disability," then there would be no need for a constitutional impeachment provision in the Illinois Constitution, which gives the sole power of impeachment to the House of Representatives, with trial in the Senate, presided over by the Chief Justice of the Supreme Court. AG Madigan again asked the Court to construe the Constitution in such a way as to render one of its provisions meaningless. At every level, from the contrived emergencies, to the selective disclosure as to bond funding delays, to the paltry legal discussion, the motion papers held little likelihood of success. The legal work, though prepared under time pressure, was not to the standards that the people and courts of Illinois deserved on such a monumental issue as the removal of an elected, sitting governor who had not yet been convicted of any crimes. 4. So if there was no real emergency, and little legal basis for the lawsuit, why was the lawsuit filed? Reading the State's court papers, it is hard to come away with a conclusion other than that AG Madigan hoped that the Court would recognize the State's difficult political problem, and make a political decision to remove Blagojevich. President-Elect Obama has called for Mr. Blagojevich to resign his office, as has every elected constitutional officer of this State. Mr. Blagojevich has refused to resign. Meanwhile, it is unclear how long impeachment proceedings and, if necessary, a trial in the Senate would take. Each of this State's elected constitutional officers has recognized the catastrophic crisis in leadership brought about by the federal complaint, and has asked Mr. Blagojevich to resign. The damage to Mr. Blagojevich's leadership ability also is recognized by U.S. Senate Majority Leader Harry Reid, who explained that any appointment Mr. Blagojevich made to the Senate "would raise serious questions." Complaint, Ex. B. So in doubt is Mr. Blagojevich's ability to provide effective leadership that, in fact, the entire United States Senate Democratic caucus requested Mr. Blagojevich to step down as Governor and insisted that he not appoint a Senator. Id. These calls by Democratic leaders for Blagojevich to resign were completely irrelevant to the legal matters before the Court. To the extent the Senate's possible refusal to seat a Blajojevich appointee was relevant, such facts argued against AG Madigan's position (as discussed above). The entire thrust of the State's papers was political in nature, essentially asking the Court to engage in a political calculation. Call me hopelessly naive, but I never expected the Court to take on this political role. If the Court had granted the motion to remove Blagojevich, or had stripped him temporarily of his executive powers, the damage would have been long lasting. In such a scenario, the Court would have created a precedent which would have guaranteed that political opponents would rush to the Court on various pretexts to challenge political opponents who had defeated them at the ballot box. The Court would have become nothing more than a pawn in the political game. The Court wisely chose not to touch this issue by rejecting the motion without explanation. In so doing, the Court avoided an additional danger. By failing to create precedent limiting the circumstances under which the Court could act to remove a Governor, the Court left open the possibility that the Court could act at some time in the future, if there were a true emergency threatening the State. Some may argue the lawsuit was worth the try, even if it was politically motivated and cynically sought to have the Court issue a politically-based decision. I disagree. Even if successful, the lawsuit would have represented the triumph of politics over the constitutional process, weakening the State of Illinois, the judiciary, and the Office of Attorney General. Does Fitzgerald Really Have Blagojevich's Blue Dress? On December 19, 2008, Illinois Gov. Rod Blagojevich went in front of the television cameras and boldly proclaimed that he had done nothing wrong, much less criminal. Blagojevich pledged to "fight" to his "last breadth," invoking words similar to Winston Churchill's "fight on the beaches" speech. Blagojevich's speech has been compared to Bill Clinton's famous address to the nation on January 26, 1998: "But I want to say one thing to the American people. I want you to listen to me. I'm going to say this again: I did not have sexual relations with that woman, Miss Lewinsky." Clinton's ability to deny his relationship with Miss Lewinsky collapsed when it was revealed that Miss Lewinsky had kept the "blue dress" containing a smudge (ugh, gross) of Clinton's DNA. At the time of Clinton's speech in January 1998, however, no one other than Lewinsky and two female confidants were aware of the existence of the stained blue dress. Clinton felt that he was able to lie to the American people because he didn't believe there was any hard evidence to contradict him. Not so with Blagojevich. U.S. Attorney Patrick Fitzgerald has announced that Blagojevich has been taped repeatedly at least over a period of several months, and perhaps years. Fitzgerald has proclaimed that the tapes prove his case, which if true, would be the equivalent of Fitzgerald having the blue dress. Yet Blagojevich gave his uncompromising denial knowing that Fitzgerald claims to have the "blue dress." It takes a special kind of person to deny accusations knowing that your opponent claims to have hard evidence; either you are supremely confident in your memories, or you are self-delusional. I can't wait until the tapes are released, so that we know whether Fitzgerald, Blagojevich, or both, have been putting us on. Illinois Governor Rod Blagojevich went on television yesterday and gave a speech to remember. What people will remember about the speech are the catchy phrases: "I will fight, I will fight, I will fight until I take my last breath" has received perhaps the most notoriety. As others have noted, Blagojevich's "fight" words were an allusion to Winston Churchill's "We Shall Fight on the Beaches" speech. Churchill's speech is one of my all-time favorites, and commonly is viewed as representing the ability of a people to overcome overwhelming adversity through a willingness to fight to the end alone. Blagojevich clearly has this understanding as witnessed by his statement that "I know there are some powerful forces arrayed against me. It's kind of lonely right now." I have been an advocate for Bagojevich doing just what he is doing, making the government prove its case promptly and in public. If Blagojevich is guilty, the facts should be laid bare for all the world to see as soon as possible; if Blagojevich is innocent, then he deserves quick public vindication. Regardless of the outcome, however, to me Blagojevich's allusion to Churchill is unforgivable. Churchill's "fight on the beaches" speech was made before the House of Commons on June 4, 1940, less than one month after taking office and just days after 338,000 Allied troops were evacuated from Dunkirk. Although viewed historically as a massive defeat, at the time the Dunkirk rescue of troops was viewed as a triumph. Churchill's speech was meant to caution Britain about the reality of what was happening in continental Europe. Sorry, Governor, but your political and legal problems do not quite rise to the level of Britain standing up alone against Hitler's armies in 1940. You may be right to fight on, but you were wrong to compare yourself to Winston Churchill. I expect that the Battle of Britain is about to begin. Upon this battle depends the survival of Christian civilization. Upon it depends our own British life, and the long continuity of our institutions and our Empire. The whole fury and might of the enemy must very soon be turned on us. Hitler knows that he will have to break us in this Island or lose the war. If we can stand up to him, all Europe may be free and the life of the world may move forward into broad, sunlit uplands. But if we fail, then the whole world, including the United States, including all that we have known and cared for, will sink into the abyss of a new Dark Age made more sinister, and perhaps more protracted, by the lights of perverted science. Let us therefore brace ourselves to our duties, and so bear ourselves that, if the British Empire and its Commonwealth last for a thousand years, men will still say, "This was their finest hour." I do not know what will be the outcome of the Blagojevich trials and tribulations, although I look forward to tracking them carefully. But I have a deep sense that history will say that the speech Blagojevich gave on Friday, December 19, 2008, was not his finest hour. Are Illinois Legislators About To Violate The Federal Wiretap Laws? During impeachment hearings before the Illinois legislature on Thursday, December 18, 2008, Gov. Rod Blagojevich's attorney, Ed Genson, repeatedly objected to legislators using "illegal" wiretap information as part of the impeachment proceeding. Illinois legislators seemed dismissive, at times opining that they were not necessarily bound by the rules of evidence. The legislators may not have realized it, but Genson fired an enormous warning shot across their bow. The use of "illegal" wiretap information is a federal criminal and civil offense. Genson's warning has put the legislators on notice of the alleged illegal nature of the material, a necessary element of the offense. Another federal statute, 18 U.S.C.A. § 2520, provides a civil cause of action whereby the victim of an illegal wiretap can sue others (but not the U.S. government) for compensatory and punitive damages resulting from the disclosure or use of illegal wiretap information. If the wiretaps on Gov. Blagojevich were illegal as Genson claims, then the use of the wiretap information may be illegal. In order to hold a defendant liable, there must be "intent," which can be shown with proof that the defendant knew of the illegality at the time of use. Genson now has put the legislature on notice, so the intent element would be established. Was that the purpose of Genson's warning? This is a very complicated area of law, and the legislators may have defenses related to the use of the material for matters of public concern. In a famous case, U.S. Rep. John Boehner ultimately prevailed on his civil claim against fellow U.S. Rep. Jim McDermont on a claim that McDermott unlawfully disclosed and used an illegal recording of a conversation in which Boehner was a party. The case took a decade to resolve, including numerous appeals and reconsideration, before the courts upheld Boehner's claim, and rejected McDermott's defenses. The moral of the story is not that the legislators would be guilty of a federal crime and open to civil claims, but that they might be and need to tread very carefully. And "might be" is a pretty big hammer for Blagojevich to use to his advantage in the impeachment hearings. As previously reported, the Association of American Law Schools (AALS) came under intense pressure to move its annual convention, scheduled to start January 6, 2009, away from the San Diego Grand Hyatt because the hotel is owned by a contributor to the pro-Proposition 8 campaign in California. Proposition 8 amended the California Constitution to recognize only the traditional definition of marriage (one man, one woman, no exceptions). In response to this hotel boycott, I asked if these boycotting law professors also were going boycott Barack Obama's inauguration, since Obama did not support gay marriage. While I received many comments, none were from law professors (although Instapundit warned: "Don’t hold your breath on that one"). One month later, Obama has selected Pastor Rick Warren to give the invocation at the inauguration. Warren is the pastor of the Saddleback Church in California, and was an active supporter of Proposition 8. Gay marriage supporters have held protests outside the Saddleback Church to protest Warren's role in denying gays the right to marry in California. So now the question remains unanswered. Will the law professors boycotting the San Diego Grand Hyatt also boycott the inauguration? And while we're at it, will the boycotting law professors also boycott those law professors who are going to be serving in the Obama administration? Reductio ad absurdum, doesn't this require the boycotting law professors to boycott the schools which employ these law professors, which will result in the boycotting law professors no longer being law professors so that they don't have to attend the AALS convention at all. Problem solved. Or will the boycotting law professors fall back on that ancient legal maxim: "Do as I say, not as I do." What If You Held A Hearing, And Impeachment Happened? I am listening to the Illinois legislature debate health care reimbursement rates and coverage, rule changes with regard to health coverage, and other very important issues affecting the people of Illinois. I'm also learning about JCAR (the Illinois Joint Committee on Administrative Rules), and how sausage is made in Illinois government. Oh, by the way, this is the impeachment hearing to determine whether Gov. Rod Blagojevich should be impeached. "Lost" doesn't begin to describe what is going on in Springfield, Illinois. The lawsuit filed by Illinois Attorney General Lisa Madigan to remove Gov. Rod Blagojevich from office had almost no legal or factual basis. Legally, the lawsuit failed to set forth any authority which would warrant the Illinois Supreme Court supplanting the constitutional impeachment process based on a novel interpretation of what "disability" means. Without such authority, AG Madigan essentially asked the Court to take on a political function, contrary to the clear separation of powers requirements of the Illinois Constitution. Factually, the lawsuit was based on very shaky allegations that the State faced an emergency so dire that the Court should not await the impeachment process. The primary "fact" supporting the emergency claim was that the State was unable to go forward with bond funding due to AG Madigan's inability to certify that Blagojevich was entitled to act on behalf of the State. This lack of funding, it was alleged, would shut down State government unless the Court removed Blagojevich. This, it was asserted, would cause "irreparable harm." But there was no such emergency. Just one business day later, the State was able to go forward with bond funding. The other alleged emergencies, such as the public's loss of faith in its government, may have been true but did not constitute true emergencies. If the Court had granted the motion to remove Blagojevich, or had stripped him temporarily of his executive powers, the damage would have been long lasting. In such a scenario, the Court would have created a precedent which would have guaranteed that political opponents would rush to the Court every time a Governor became unpopular, or suspected of political corruption, or ... well you get the picture. The Court would have become nothing more than a pawn in the political game. The Court wisely chose not to touch this issue by rejecting the motion without explanation. In so doing, the Court avoided an additional danger. By failing to create precedent limiting the circumstances under which the Court could act to remove a Governor, the Court left open the possibility that the Court could act at some time in the future, if there were a true emergency threatening the State. Sometimes it is most wise to say nothing, and the Court acted wisely in this case so as to preserve its power to act in the future. When people bring frivolous lawsuits, the justice system is damaged. And that is never more true than when the person bringing the suit is the chief legal officer of the State. Fortunately, the Illinois Supreme Court saw the danger and found the most sensible way to prevent irreparable harm to the judiciary and the political process. As we predicted repeatedly (here, and here, and here, and here), the Illinois Supreme Court has rejected the unprecedented request of Attorney General Lisa Madigan to remove Gov. Rod Blagojevich from office, or alternatively, strip Blagojevich of his executive powers. The motion was ill-advised, legally weak, and based on assertions of a state emergency that were suspect at best. Though issued without explanation, the simultaneous ruling that AG Madigan is not even permitted to file a Complaint seeking Blagojevich's ouster is a stinging rebuke to AG Madigan. These related posts lay out the fundamental weakness of AG Madigan's legal theory, strategy, Court brief, and actions subsequent to filing. This is a case which never should have been brought, and kudos to the Illinois Supreme Court for rejecting the case without explanation so as not to create any precedent (as I hoped would happen, see posts below). Is Blagojevich Calling The Madigans' Bluff? Illinois Attorney General Gets a Grade of "C-"
We will be following the Blagojevich impeachment and criminal proceedings very carefully, day-by-day, so please bookmark / fav / link / follow us. The Illinois legislature has a problem. It has little guidance as to the standard or procedures for impeachment of Gov. Rod Blagojevich, and must be mindful of not ruining the criminal prosecution commenced by U.S. Attorney Patrick Fitzgerald. Blagojevich will use the legislature's dilemma to his advantage, put the legislators' own conduct on trial, and use the impeachment proceeding to disrupt the criminal prosecution. The legislature's dilemma stems from the fact that the Illinois Constitution gives no guidance as to the standard by which a Governor is to be judged in an impeachment trial. When most people think of impeachment, they think of the words "high crimes and misdemeanors." But those words come from the U.S. Constitution (Art. II Sec. 4: "The President, Vice President and all civil Officers of the United States, shall be removed from Office on Impeachment for, and Conviction of, Treason, Bribery, or other high Crimes and Misdemeanors."). Article V, Section 6(b) -- "If the Governor is unable to serve because of ... conviction on impeachment ... the office of Governor shall be filled by the officer next in line of succession...."
Article V, Section 6(d) -- "The General Assembly by law shall specify by whom and by what procedures the ability of the Governor to serve or to resume office may be questioned and determined. The Supreme Court shall have original and exclusive jurisdiction to review such a law and any such determination and, in the absence of such a law, shall make the determination under such rules as it may adopt." Article IV, Section 14. "The House of Representatives has the sole power to conduct legislative investigations to determine the existence of cause for impeachment and, by the vote of a majority ofthe members elected, to impeach Executive and Judicial officers. Impeachments shall be tried by the Senate. When sitting for that purpose, Senators shall be upon oath, or affirmation, to do justice according to law. If the Governor is tried, the Chief Justice of the Supreme Court shall preside. No person shall be convicted without the concurrence of two-thirds of the Senators elected." Does the Constitution allow a "committee" to make procedural determinations? Must the House hold evidentiary hearings prior to voting to impeach, or are mere accusations enough? What will a Senate trial look like? Must the proof be beyond a reasonable doubt? Do the rules of evidence apply? What is the role of the Supreme Court Chief Justice at a trial, and would it violate the Constitution for the Chief Justice to make rulings? Can the Chief Justice reverse procedural determinations of the legislators? Can the Governor call witnesses in his defense, and can he compel production of documents and testimony? And perhaps most important, can the Governor call legislators as witnesses? There are no standards of conduct set forth in the Constitution by which to judge whether impeachment is warranted. In the absence of a constitutional standard, the legislators should determine whether the Governor's conduct was out of the norm for Illinois public officials, including the legislators themselves, with regard to public business. If the Governor's conduct is not out of the norm for public officials and legislators, how can the legislators conclude that the Governor should be removed from office. To do so would render impeachment a routine procedure, whereas it is considered extraordinary. In order to pursue this defense, the impeachment trial of necessity must consider what is the legislative standard of conduct, including giving the Governor the opportunity to call legislators as witnesses. To the extent the legislature considers criminal conduct as a standard, then the Governor needs at least all the protections available to him in a criminal trial, including the right to all evidence, to cross-examine witnesses, and the power to subpoena witnesses and evidence in his defense. The U.S. Attorney's office has evidence relevant to the Governor's defense, and such evidence should be subject to subpoena in the impeachment case. If this precipitates legal challenges by the U.S. Attorney's Office to any such subpoena, only the legislators (not a federal court) may rule on such challenges since only legislators have the power to make decisions as to the impeachment proceeding. The impeachment hearings will put the entire legislature on trial, and will be used by Blagojevich to help prepare his defense of the criminal case. The criminal case, after all, is what Blagojevich is, or should, be worried about. News Alert: There already is a mileage tax. It's called the gasoline tax. Motorists pay state and federal taxes on each gallon of gasoline they purchase. Gasoline usage reflects mileage driven. So the new mileage taxes really aren't anything new, just double taxation of the same thing. Can't We Be More Like Europe? The violent unrest that followed the shooting of a 15-year-old boy has driven Greece to the brink of a political crisis. The rioting marks an explosion of rage by the country's young people who have few prospects of carving out a place in a society where all initiative is stifled. The first attempt of Illinois legislators to meet to lay the groundwork for impeaching Gov. Rod Blagojevich didn't get off the ground. The legislative committee put together by House Speaker Michael Madigan stopped working after less than two hours. Reports indicate that the committee was stymied when U.S. Attorney Patrick Fitzgerald raised concerns over what evidence he would turn over to the legislature, and Blagojevich's attorney Edward Genson requested the right to participate in the committee's meetings to ensure fairness to the Governor as procedures are developed. Blagojevich's refusal to resign has put the legislature in a difficult position procedurally and substantively. The legislature needs to develop procedures since none presently exist, but allowing Blagojevich's attorneys to participate in the process will bog down the committee's work. At the same time, the legislature needs to prepare to prove its case against Blagojevich, but in order to do that, it needs the evidence in the hands of Fitzgerald, who obviously doesn't want his key witnesses exposed to cross-examination in the impeachment hearing prior to the criminal proceeding. Fitzgerald also should be concerned as to what Blagojevich will do as part of his defense in the impeachment proceeding, particularly if Blagojevich has the power to subpoena witnesses and evidence related to the criminal trial. The impeachment proceedings could become a stalking horse to help Blagojevich defend the criminal trial. So Blagojevich has created a daunting problem for the legislature, which needs (or at least thinks it needs) Blagojevich's consent to procedures, and Fitzgerald's consent to substantive evidence. The legislature is not in control of its impeachment destiny. Lacking procedures or substance, the Illinois legislature is like a rudderless ship caught in the storm surrounding the criminal trial. As we have noted before, Blagojevich seems on the road to besting Attorney General Lisa Madigan in the weak Supreme Court lawsuit seeking to oust the Governor, and now appears on the road to besting Speaker Madigan on the impeachment front. So far, score 2 for the Governor, zero for the Madigans. But Fitzgerald has yet to come to the plate.